Should You Ever Be Worried About Your Cat Rolling In Dirt? The dirt outside your home may have a cool effect on the cat, especially on a scorching hot day. The layer of dirt underneath the top dry layer is soft and moist. This layer of dirt is comprised of a watery composition, thus making it somewhat cooler than its crusty outer layer, which gets hit directly by the sun. On such cool dirt areas, your furry friend may tend to make themselves a small burrow for rolling around in and cooling down subsequent to an afternoon hunt or game. However, you can also use a cat m​​​​at to keep it cool. There are many ways for cats to leave her mark such as laying on paper, sleeping in the cat litter box, peeing or pooping everywhere, and the like. Marking scents can play a big role in dust bathing for the cat. When the cat rolls in dirt, it is marking the region with its scent glands that are situated on its cheeks, paw pads, and at the crest of its heads. The cat might have parasites in her fur, owing to which it would like to scratch by rolling in dirt. Rubbing their bodies in a dirt area may aid in removing the parasites like fleas as well. Fleas or other varmints could be lurking around in your cat’s fur, thus making her or him do all in their power to kill that itch. The use of cat flea collar is a way to kill ticks and fleas quickly. You can save your cat from further irritation or pain by examining her or his coat carefully for indications of unwelcome bugs. Whilst evaluating your kitty’s skin, also check for irritated reddish patches and signs of shedding. These additional clues can let you know for sure if she or he could also be suffering an abnormal skin ailment and requires a visit to a professional vet. Your backyard can be akin to a huge delightful playground for your furry friend. You cat will have an ample choice of trees for climbing, grass for nibbling on, birds for chasing, and a whole flower bed to spring and jump around. If a cat spends most of his or her time outdoors, they may be simply rolling in the dirt, so as to keep themselves entertained. This can be a good source of keeping busy when you are not at home. Among the main reasons behind why do cats roll in the dirt is inside their digestive systems. Dirt rolling tendency covers a cat’s coat with bacteria, which they ingest in the next grooming occasion by licking it off their coats. Cats supplement and restock the gut bacteria, keeping it at healthy amounts and guaranteeing that they get good digestion. This dirt rolling behavior is not exclusive only in case of cats, but is seen in most mammals. According to most cat experts, this rolling in the dirt behavior can actually feel quite pleasant, like a bit of a massage. Also, it releases tension, rubs itchy spots, and stretches the body in all areas. This dirt rolling tendency can also assist in removing stray hairs from a cat’s coat. A cat might be rolling in the dirt to get rid of an indoor smell. This reason is, however, not a verified point in case of this behavior. Your cat could also be trying to do away with the smell of another feline who may have tried to make the dirt spot with their own signature scent. As cats are very territorial by nature, this can seem like a very viable reason for rolling around in dirt. If the cat has been playing with a nip toy or if you are growing catnip in the garden, then your cat can be rolling in dirt in elation. This is due to the common fact that elated rolling around stems from a side reaction of the ‘high’ feel, which your cat develops by means of the psychoactive properties in catnip. This is again nothing to stress about, as catnip only serves to help a cat in feeling relaxed and calm. Although, be warned that if you are growing the catnip plant in your home area, you can sometimes expect a lot of visits from your neighborhood cats who can be attracted to its smell. It is also necessary for you to learn how to prevent cats from defecating in the garden. Here are 9 methods you can use to stop cats pooping in your garden. Dirt-rolling behavior by cats is in fact a very common thing to do. This particular habit is a cat’s way of expressing its needs. Even though such actions might seem perplexing to you, it is very primal and natural for your furry friend. Catnip can be one of the culprits, but in most cases, your cat might just be seeking your attention. 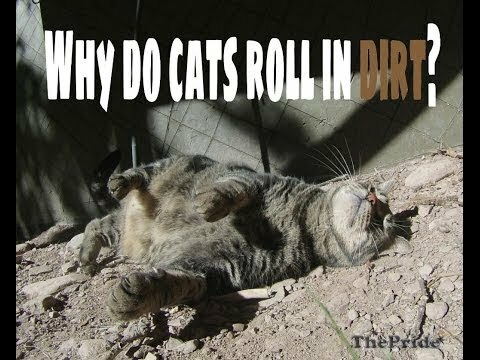 This is a helpful video that can explain you in a better way as to why do cats roll in the dirt. In order to make your cat stop making a mess at your home, make sure you train your cat to use a litter box for better hygiene around your home. Additionally, if your cat has caught mats after rolling in dirt, you can get them out easily by reading this. The chief reason why cats roll in dirt is because they feel nice. It can be annoying to a cat parent as cats bring back dirt into their homes and leave patches all over their sofas and beds. This can, of course, be somewhat annoying, but your cat seems to derive pleasure from this dirt rolling habit, that in the end is a very small price to pay. To maintain hygiene, you can use these moist wipes for wiping the bottom of your cat. If you like this article, then please share it with your friends and family. In case you have any more questions for us, you can leave them in the comment box below.